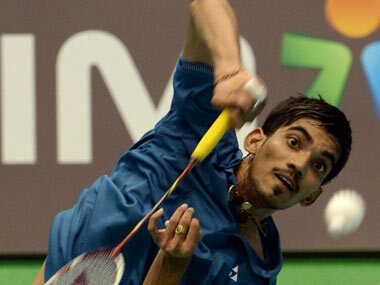 Mumbai: Kidambi Srikanth showed his rising stature in world badminton with a shock maiden victory over former world no. 1 Lee Chong Wei of Malaysia, but could not prevent his team Bengaluru Top Guns from going down to Hyderabad Hunters 2-3 in the Premier Badminton League, here today. Later, Chennai Smashers upset hosts Mumbai Rockets 4-3 by clinching the deciding fifth rubber when Indonesian former world no. 3 Simon Santoso got the better of India's R M V Gurusaidutt in straight games in the victors' trump game. This was Mumbai's first defeat after their win over Awadhe Warriors yesterday. 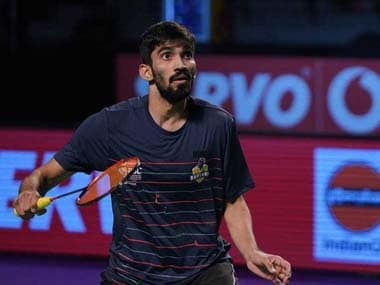 By the time Srikanth stepped on court to play against his Malaysian opponent Lee Chong, commanding the highest price of USD 100,000 in the League along with Indian woman stalwart Saina Nehwal, the tie against Bengaluru had been wrapped up by the Hyderabad team at the NSCI Sardar Vallabhai Patel indoor stadium. The Hunters started on a losing note by dropping the opening women's singles, but then made ample amends by clinching their trump game, the men's doubles encounter, as well as the other men's singles match-up won in straight games (15-14 15-13) by London Olympic Games quarter finalist Parupalli Kashyap against Sameer Verma, nominted as the trump by Bengaluru. With a 3-0 lead after the first three games, Hyderabad could not lose the tie even if they lost the last two matches the mixed doubles clash and the prime slot face-off between Lee Chong and Srikanth. And that was exactly what happened when Ashwini Ponnappa teamed up with Dane Joachim Fischer Nielsen to outsmart her regular women's doubles partner Jwala Gutta and Markis Kido 15-13 15-13 to leave Srikanth to finish off the tie on a rousing note by upsetting Lee Chong. Srikanth, currently the world no. 9, played aggressively against the Malaysian world no. 5 and pulled off a fine 15-12 6-15 15-7 win over Lee Chong Wei to whom he had lost four times at the international level and in the Indian Badminton League as it was named earlier in 2013. "I'm very happy to beat Lee. It's always great to beat someone that good," said Srikanth who punched the court in glee after smashing his way to a memorable win in the last game in which he cantered home with a series of smashes close to the lines after taking an early 7-2 lead. .
Srikanth made good a 0-5 deficit in the opening game before clinching it, had no answer to his rival s crafty play in the second before turning it around in telling fashion with a series of winning smashes in the deciding third game. The Hunters, in fact, rallied from an early loss to overcome the Hot Guns. Hyderabad started on the wrong foot by losing the first match, the women's singles clash, when their Thai signing Supanida Katethong was beaten in straight games (15-8 15-11) to Bengaluru's Suo Di. However, the Hunters gamble of making the men's doubles clash as their trump match paid rich dividends as the scratch combine of Carsten Mogensen of Denmark and Indonesian Markis Kido fought back from a game down to get the better of Bengaluru's Malaysian pair of Hoon Thien How and Kim Wah Lim 13-15 15-9 15-14. 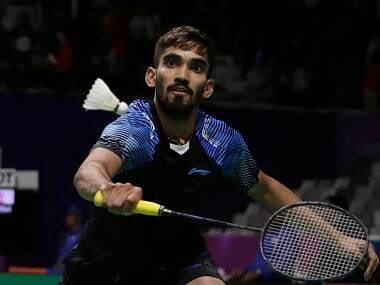 The 2-1 advantage that Hyderabad secured made it imperative that Bengaluru's Sameer Verma clinch his men's singles trump match against higher ranked rival Parupalli Kashyap but it was not to be as the latter won 15-14 15-13 to provide Hunters with a winning 3-0 points lead. 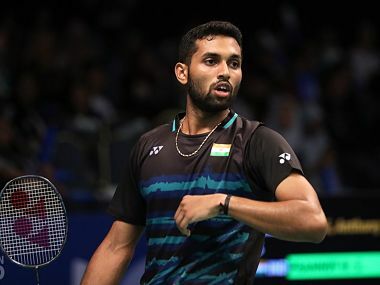 In the Mumbai-Chennai clash, the hosts rallied after losing the opening mixed doubles as they wrapped up the men's singles through HS Prannoy who beat Frenchman Brice Leverdez 15-8 15-11 and then the their trump men's doubles in which Mathias Boe and Vladimir Ivanov wore down opponents Chris Adcock-Pranaav Chopra in three hard-fought games. The two wins gave Mumbai a 3-1 points lead which was reduced to 3-2 when PV Sindhu of Chennai, current world no 12, edged her way past Mumbai's Chinese recruit Han Li, a former world no. 11, 15-8 11-15 15-8 in a hard-fought encounter to take tie to the deciding fifth rubber. Santoso proved too strong, though he is currently ranked beyond 100, for Guru and defeated the latter 15-9 15-12 to clinch the issue for Chennai. Hyderabad Hunters beat Bengaluru Top Guns 3-2 (Points)(Supanida Katethong lost to Suo Di 8-15 11-15; Carsten Mogensen/Markis Kido beat Hoon Thien How/Kim Wah Lim 13-15 15-9 15-14; P Kashyap beat Sameer Verma 15-14 15-13; Jwala Gutta/Kido lost to Ashwini Ponnappa/Joachim Fischer Nielsen 13-15 13-15; Lee Chong Wei lost to Kidambi Srikanth 12-15 15-6 7-15). Kamilla Juhl/Vladimir Ivanov lost to Chris Adcock/Pia Zebadiah 10-15 15-7 11-15; H S Prannoy beat Brice Leverdez 15-8 15-11; Mathias Boe/Vladimir Ivanov beat Chris Adcock/Pranaav Chopra 15-10 9-15 15-13; Han Li lost to P V Sindhu 15-8 11-15 15-8; R M V Gurusaidutt lost to Simon Santoso 9-15 12-15.